On 25th me and my uncle Jände had an effort to twitch that long staying, but always some how ephemeral Cinereous Vulture from Kirkkonummi. Bird was sitting there on a tree and was seen by many, but cause we had our duties earlier, we were late of course. During the drive to Kirkkonumi we got message that bird disappeared again and there was no idea were it went. Anyway we went to the birdtower, but late is late and we got nothing. After that there is only some uncertain records of the bird... So no vulture for me..
On 28th I was driving with my family in Pasila, near our house and I spotted an Hawk Owl from the car window. Quick turn and there it was sitting on a tree and then on a lamppost. I parked the car and took some record shots through my telescope. 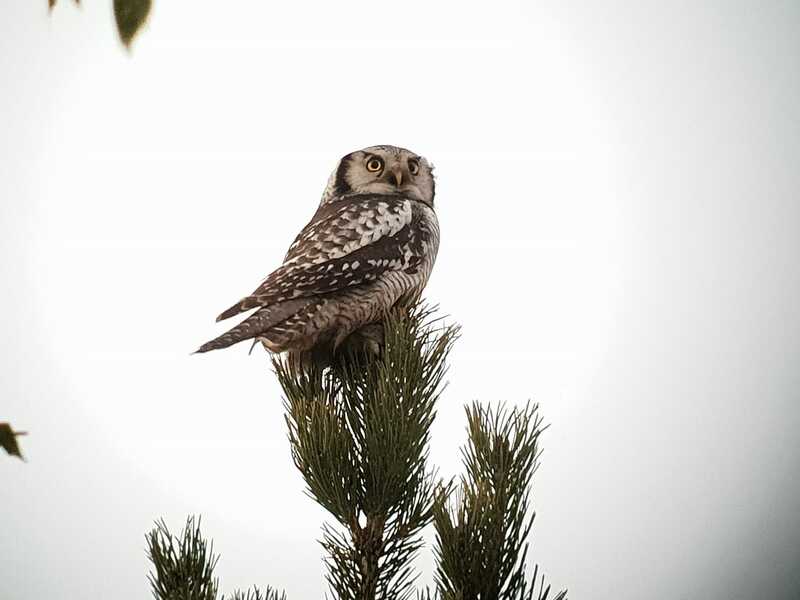 Hawk Owls are not so common here in Helsinki and you need serious luck to find one among hundreds of birders. Bird was not seen again in same site, but I´m sure that someone will find it somewhere near very soon. November is coming and there is less and less birds here in Finland, so let´s enjoy all that we still have.